I met a lady in Singapore last month and she wanted to know, is it safe? Is it safe to go the Middle East with Interserve at the moment? I said I don’t know. Then I met a lady in the supermarket last week and she said, is it safe? Is it safe to go back to Nepal at the moment? I said I don’t know. Last month, Darren went back to Nepal to help with earthquake relief. He said it was a privilege to be there, supporting the Nepali physios and being there with them through the second, devastating earthquake. He came home safely two weeks later. This week, we came down to the South Coast for a short break, to recover. We chose the quietest, most restful spot we could find, by the water. 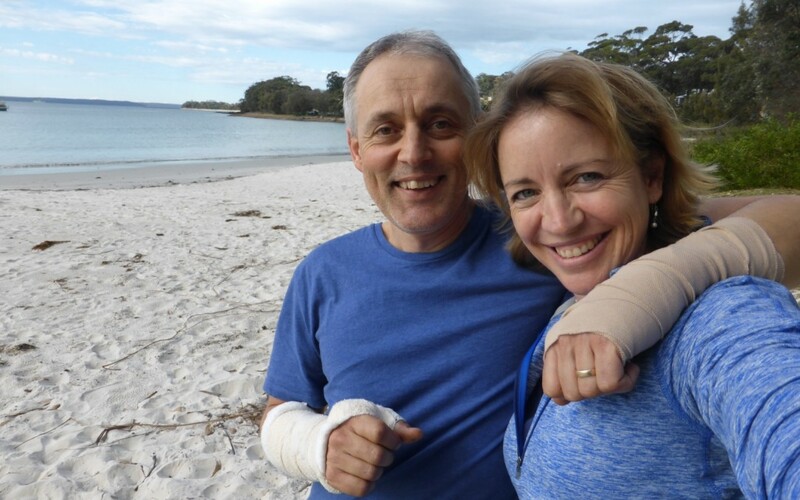 Within hours of being here, Darren came off his bicycle and he ended up at Nowra Hospital. He’s fine. He only needed one plaster. But it made me think. Is it safe to get up today? I don’t know. We don’t know. But we will get up… because we know there are other, better questions. Life isn’t safe… but it’s a beautiful gift.